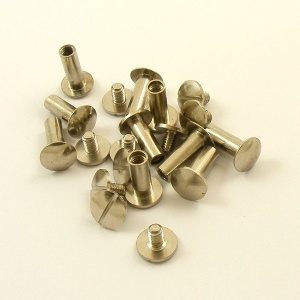 These joining screws are excellent for making semi-permanent joins in your leathergoods. They're ideal for belts with interchangeable buckles and for adding and removing bag straps , gun slings and more. 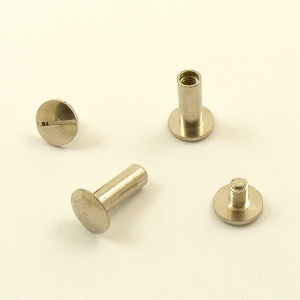 They make a great alternative to a rivet, if you may want to undo the join at some point in the future. Easy to fit, one half goes through from the back, the other half screws in from the front, and the screw can be tightened with a straight head screw driver if necessary. You can add some super glue to the screw thread if you want a permanent join. This is a pack of 10 extra long nickel plated joining screws.